Federica Marangoni works in Venice as an artist and designer. She trained at the Venice art school in the early 60s and began to exhibit at the Bevilacqua La Masa foundation. 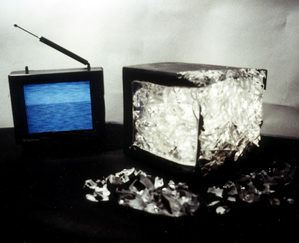 Her work was above all concerned with new plastic and neon materials and then, in the 70s, it shifted its centre of interest to the use of videos in order to record her works and installations which always included glass, a material that is basic both to her sculpture and her design. In 1970 Federica Marangoni opened the Fedra design studio in Venice. 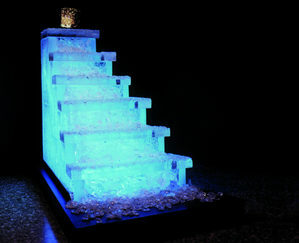 This was an activity that, regarding both cultural and professional choices, was to go hand in hand with that of sculpture and was to be actively developed in an eclectic way, ranging from corporate and graphic design to product design and special projects for environments and installations. Glass was a particularly important part of her work from the beginning of the 70s as a conceptual element of her own way of life, something that was fascinating yet ephemeral, ambiguous and complex, a noble yet infinitely ductile material. In 1970, in Murano, she began to create both small sculptures and objects for mass production. She produced at the same time a modular dovetailed work in glass blocks; this was produced in cooperation with the Salviati glassworks and was exhibited at the Venice Biennale in 1970 and then shown again in the 1995 Biennale held in Ca’ Pesaro on the occasion of the group show “Percorsi del gusto”.In 1971 she was invited by Giò Ponti to take part in Eurodomus, Turin, for the entrance hall of which she created a large luminous form made from tubular elements tied together by a band, a reference to the well-known Venetian sign-form that was later to become a popular glass lamp and was also to lead to her working with lighting companies. 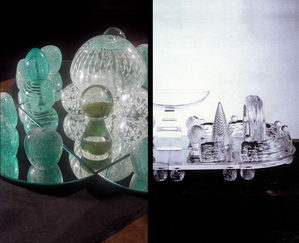 She then continued working with this material both in Murano and with other Italian and foreign companies that are working in the sphere of artisan or industrial glass production, both as a sculptor and designer.Throughout the 80s she worked as a consultant and glass-product designer for Tiffany, for the old Salviati firm in Murano as well as for the new Salviati company; for Corning Glass, New York; the I 3-Alt. Aureliano Toso Venice firms; Christofle in Paris, and Bormioli di Fidenza Vetraria. 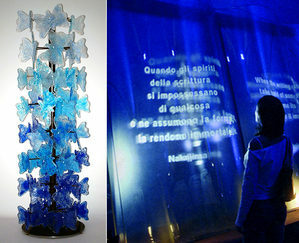 She later also created two large-scale works in industrial glass for S.I.V. 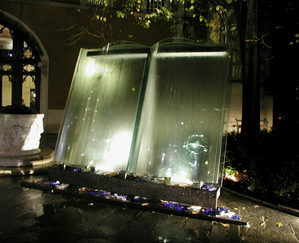 and for Pilkington: these were, respectively, a large “labyrinthine fountain” for the city of Seville, and a book of curved glass sheets measuring 3 x 2.70 m. for Glas Tec, Düsseldorf, in 1997. As teacher she was invited by professor Mazzariol to hold lessons and workshops for the technology of new materials at the Venice International University of Art from 1974 to 1976. From 1976 until 1989 she worked at New York University where she was assistant professor in the art and art education department; she held courses in New York and summer seminars in Venice concerned with sculpture and design and, in particular, with the material “glass”. She has held lectures in various universities and cultural centers in the U.S.A.: Wayne State University, Detroit, Michigan (1977); Center for Creative Studies, glass department, University of Art and Design, Detroit, Michigan (1979); Paterson School of Design, Altos de Chavon, Dominican Republic (seminar: November 1984); Pratt Institute, New York (1995); Virginia Beach Art Center (1996). Her most recent conferences were all concerned with the theme which she has dealt with and theorized about from some time: Art, Arts & Crafts, Design: confrontation, analysis, and interactivity. She has a wide experience as coordinator of exhibitions as well as installations, including those for fairs, and catalog editing.She has also created public works in Spain: EXPO’ 1993, the “La Trappola della Memoria” sculpture-fountain for the city of Seville; 1993, Barcelona, “La Nascita della Luce”, an iron and neon work in the form of a great “bobbin” commissioned for the new headquarters of FECSA, Fuerzas Electricas de Cataluňa. For Tenerife she then created a hanging work for the government square and, in 2008, she installed a large-scale work in the streets of Manhattan, New York. In april 2012 she took a conference in Rome at MACRO about VideoArt in Italy in the '70. In 2013 she exhibited in Milan at Salone del Mobile the artwork GO-UP (Through Architecture), at Marble Weeks in Carrara and the artwork GO-FOREVER at Arsenale, Venice.